Perhaps Winslow Homer's most beloved and popular painting was Snap the Whip, created with oil on canvas in 1872. Children embodied innocence and the promise of America's future and were depicted by many artists and writers during the 1870s. Here Homer reminisces about rural simplicity and reflects on the challenges of the complex post Civil War world. 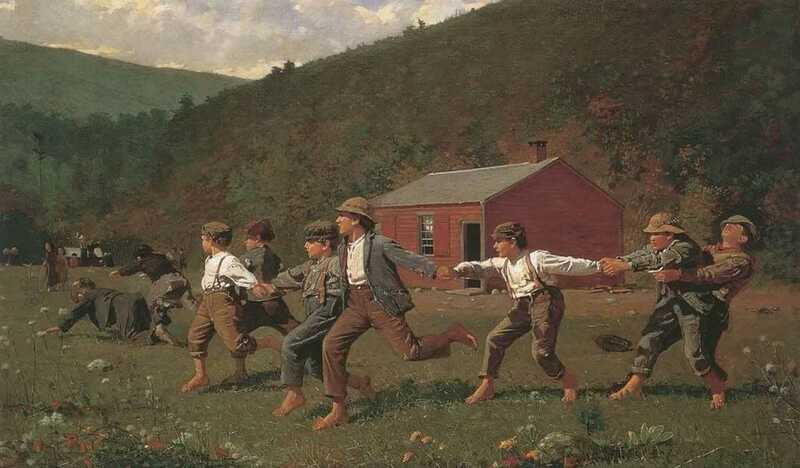 The historic painting depicts nine young boys playing the age-old game entitled Snap the Whip.The children are pulling and tugging each other back and forth, while the two at the end of the line have fallen over. The soft, glow of sunlight that peaks through the clouds illuminates their faces. Their clothing, more specifically their caps, suspenders, and short pants, reflects true late 1800 American attire. Featured in the background is the familiar little red school house; the school teachers in the distance are most likely meant to be supervising the usual recess activity. The scenic landscape of trees and wildflowers bordering a small field is so realistic that the viewer can almost hear the chirping of the birds and the buzzing of the insects. The boys' bare feet signal childhood's freedom but their suspenders are associated with manhood's responsibilities. Observed from right to left, Homer's boys hang on to one another, strain to stay connected, run in perfect harmony, and fall away, enacting all the possible scenarios for men after the Civil War. Winslow Homer created a second, much smaller version of this painting, replacing the mountain range in the background with a wide, blue sky. Snap the Whip was a huge success for the artist, and the painting was frequently reproduced. It was displayed at the 1876 Centennial Exposition in Philadelphia.